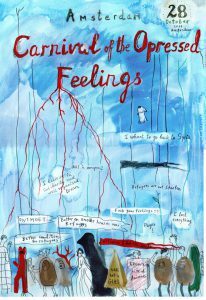 On Saturday, October 28, 2017 the Carnival of the Oppressed Feelings will fill the streets of Amsterdam. This performative march, initiated by Russian artist Gluklya and TAAK brings together refugees housed in the center for asylum seekers at the former prison Bijlmerbajes, artists and everyone who feels involved, in a grotesque carnival. We will gather on Saturday 28 at 1 pm in front of Lola Lik, the cultural hub at the former Bijlmerbajes. The entrance is at the South of the prison complex, H.J.E. Wenckebachweg 48. Will you use public transport, then take the metro 51, 53 or 54 and get off at Spaklerweg station. Follow the path right between the prison and the train rails. -What should I wear or bring? Would you like to wear one of the costumes that are made especially for the carnival, then please make sure that you are present at 12 am at the Tijdelijk Museum. (click here for directions). The Tijdelijk Museum is located in Lola Lik. Of course, you can also wear your own clothes or create your own demonstration outfit. Please also bring stuff to make noise like pots, pans and spoons. -What does the route look like? Click here for the Route Carnival of the Oppressed Feelings. The walk is about 5 km. -How do I get back to the Bijlmerbajes when we arrive at the Dam? The demonstration will come to an end around 3.30 pm. If you need to get back to the Bijlmerbajes to pick up your bike then take the metro from the Central Station (metro 51, 53 of 54, get off at Station Spaklerweg). For refugees from AZC Wenckebachweg, transport has been taken care of. -Kids are more than welcome to join, we also have kids’ costumes! -Costumes can be worn on top of your normal cloths. -At the end at the Dam you can hand in your costume. -Don’t forget to go to the toilet before we leave as we have no sanitary stops along the way! -Bring all your friends and spread the word!